Deaths down 90 percent in Syria truce zone, group says. 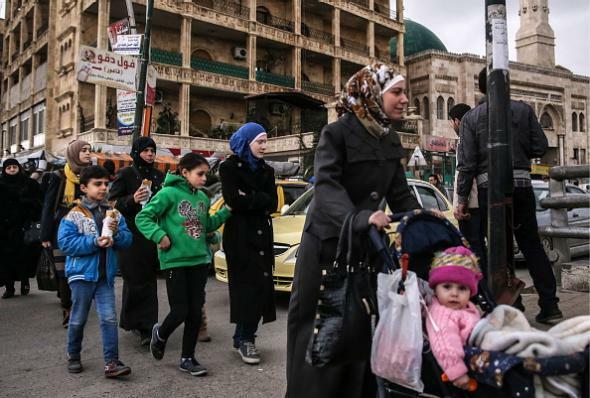 Syrians in the partly rebel-held city of Aleppo on Friday. The Britain-based Syrian Observatory for Human Rights, an opposition group that closely monitors the conflict using activists on the ground, says the overall violence has decreased by 90 percent. It documented the death of 118 people in areas included in the cease-fire agreement in its first five days—a sharp drop from the daily toll before the truce. On Friday, it reported 12 people had been killed in Syria on Thursday—the lowest daily toll in 13 months. There are major caveats, however. The truce, negotiated by the United States and Russia, does not cover the significant sections of the country held by ISIS or the al-Qaida–affiliated Nusra Front. Significant civilian and military casualties continue to be reported in those areas. The truce, moreover, is a temporary agreement to cease hostilities, not part of a comprehensive peace deal. And the goal of permanent peace in Syria remains a long, long way from being fulfilled.